One of my personal favorites! 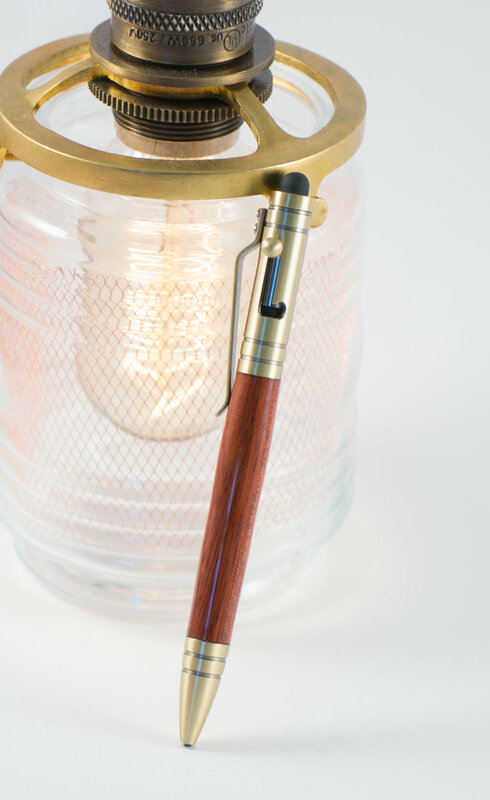 Featuring the deep chatoyant beauty of bloodwood and brass, this pen is perfect for any steampunk fan, particularly those looking for a subtler, less 'cog-on-a-stick' style. This pen uses a special 'bolt-style' click mechanism that utilizes a sliding lever on the side of the pen. The end of the pen has a removable touch-screen 'nib', for use with touch-screen phones and tablets. The wooden portion of the pen is hand-turned, and sealed with a glass-smooth acrylic finish, which protects the wood and gives it a gorgeous glossy luster. The ink cartridge is replaceable with any 'Parker'-style refill, available at most office supply stores. Please allow 7-10 days for custom orders and 2-4 days for shipping (most places).